Posted on 27, July 2016 by EuropaWire PR Editors | This entry was posted in Education, Electronics & Machinery, Science, United Kingdom and tagged optoelectronics, Professor John Marsh, Shanghai Lingang Science and Technology Innovation City Economic Development Co. Ltd, University of Glasgow. Bookmark the permalink. GLASGOW, 27-Jul-2016 — /EuropaWire/ — The University of Glasgow has signed a partnership agreement with one of the most important state-owned enterprise companies in China to develop an international optoelectronics industry base in the Lingang area of Shanghai. A Memorandum of Understanding was signed earlier this year by the University and senior representatives of the Shanghai Lingang Science and Technology Innovation City Economic Development Co. Ltd – a subsidiary of the Lingang Group which specialises in industrial park development – and the Shanghai Shunmao Information Technology Co., a private company established to manage and commercialise some of the technology which will be developed by this exciting new initiative. 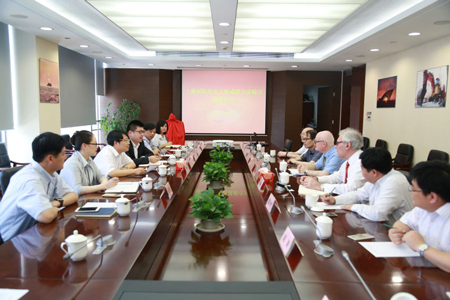 Professor John Marsh, Professor of Optoelectronic Systems and Dean of the University of Glasgow-University of Electronic Science and Technology of China (UESTC) Partnership, attended an inaugural event at Lingang representing the University of Glasgow. The agreement has led to the establishment of the Shanghai Lingang International Photonic Integrated Circuit Joint Laboratory (PIC Lab) which will foster collaboration between the University of Glasgow and its partners in Lingang. PIC Lab aims to accelerate the development and commercialisation of optoelectronic integrated chip technology, integrating multiple optical components on a single chip and packaging the chips with high-speed electronics, to address the demand for high speed network connections for the next generation of the Internet. A spokesman for the Shanghai Lingang Science and Technology Innovation City Economic Development Company said the new PIC Lab would capitalise on the combination of domestic and foreign skills and resources to develop “an effective concentration of high-end technical and commercial talent in the field of photonics to deliver a world-leading, cutting-edge technology and industrial capital”. The partnership would also give clear leadership to the global PIC industry and offer a strong impetus to optoelectronic integrated chip technology research and development and attract further domestic and foreign optoelectronic talent technology, added the spokesman. The Chinese partners in the agreement plan to visit the University of Glasgow later this year to promote and cement this newly-formed bilateral cooperation project.